Partnering with today's leaders to create social change. Thrive Foundation for Youth grantees in a design-thinking exercise. A hands-on learning experience meant that eight participants spent the afternoon together with Cynthia Benjamin and myself – digesting an introduction to Human Centered Design (HCD) through the direct application of principles to real-life challenges. Each participant was a changemaker – tackling complex social issues ranging from education, women’s rights, to aging and litigation. They wanted to see what design thinking could offer beyond traditional communications research. Use the ethnographic interview to go deeper. In the workshop, we compared two approaches to research ­– traditional and design thinking – in one exercise: Healthy Breakfast, examining attitudes about children eating breakfast. First, we role-played a more traditional focus group seeking people reactions to our 3 stories’ narratives, words and messengers. 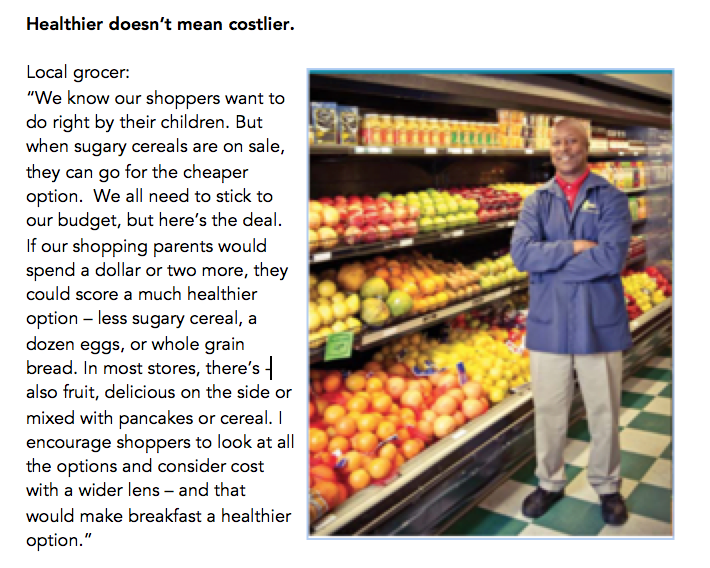 “The grocer was too preachy”, “Making time and enjoying (breakfast) is something I try to do”, and “I liked the specificity and providing options” were comments that came from our participants playing focus group members. Response to specific messages were clear but limited to the words and their messengers. Then, for the group’s HCD’s ethnographic interview, two participants partnered up and asked each other open-ended questions designed to elicit stories and feelings, such as “share a childhood memory about breakfast or food in your home growing up”. Interviewers were instructed to watch for facial expressions, body language, inconsistencies and surprises. Insights that came out of that process: weekend breakfasts were more memorable, recalling self-indulgence and guilt about food, enjoyment of choice and food options, remembering smells, and childhood experiences that might influence breakfast choices. Although both approaches addressed the same problem for communicators, the HCD process more quickly yielded emotional experiences in a broader range and could be more useful for early-stage understanding of your target audience. All agreed that more-traditional messaging research can fit in HCD, but may be employed best at the end of HCD’s exploration process in looking for feedback on specific prototypes, a later analysis in the HCD process. Frame the problem by opening up the question. Another diverging principle from the traditional framing of the problem is that Human Centered Design doesn’t begin from a hypothesis to test, but rather from deeply understanding a problem that people themselves are trying to solve. In this phase of HCD, we consciously keep our own opinions at bay, while trying to understand the attitudes and beliefs of our target audience. One of the interesting approaches we gain in communications through design thinking is re-focusing our problem definition from what WE want to see happen, e.g. “we need to convince more people to vote,” to the problems that people themselves are trying to address, e.g. “students want to fulfill their responsibilities as voters but need easy access regarding to how to engage.” We then look to communicate to address that need. Explore lots of ideas to have one good one. To expand understanding of issues that participants brought to the workshop, the group split up into three smaller teams – and worked through elements of our three challenges using idea maps – a graphic, free-association process to help communicators “find a way” around a topic. We then reformed our small groups and brainstormed two of the insights gained from the Idea Maps. This process differed from a typical brainstorm. First we got our creative juices flowing by starting with an unrelated but fun challenge, delving into all of the uses for a paper clip – and then – after re-framing our problem question – we explored possible answers to the question. This approach to idea generation, based on new insights from the target audience perspective and a guided brainstorming experience, yielded several new approaches to real-life strategic communication challenges for participants. The group took away lessons about HCD, practice using a few tools, and real ideas for challenges they face in their work. This class was intentionally small, which was appreciated by our workshop folks – and our small group was not limited to one field. There are lots of opportunities to learn more about HCD – both through online courses, reading this overview, or attending our next Human Centered Design Hands-On Workshop. You can learn about the full curriculum and other details here. We encourage you to explore this creative process for your social impact communications.